Backing up data is challenging, especially for SMB, who want faster backups, smaller backup windows, and faster recovery. Deduplication eliminates redundant data and makes backup to disk as cost effective as backing up to tape. With recent developments and innovations, deduplication options are now integrated into backup software, making it more affordable. Combining media server deduplication with client deduplication on selected systems results in a cost-effective solution for small businesses, and investments in tape can continue to be leveraged for offsite backup and archiving. Combining Drobo for disk backup and deduplication as a component in backup media server software provides a solution that is less than half the cost of any entry-level deduplication solution. And the incredible ease-of-use is a big plus! Backing up data is not fun, and no one is really happy with their backup strategy. This is especially true for smaller organisations who want faster backups, smaller backup windows, and faster recovery. The most popular backup architecture for several years has been backup to disk versus directly to tape. Known as "disk to disk," "D2D," and "B2D," disk backup eliminates tape media loading and positioning resulting in faster backup and recovery. Small companies can invest in backup but they do not have the budget to invest in the same technologies and approaches to backup used by larger organisations. Tape continues to be part of the strategy for offsite protection and long-term archiving, and for many small businesses, the only strategy because of its lower entry cost. With new technologies such as data deduplication, or dedup, the amount of data stored on disk can be drastically reduced 9:1 on average. A small amount of disk can now store the same amount of backup data that tapes with 2:1 compression can store—making the total cost of disk lower than tape in addition to all of the other benefits. While disk continues to increase in capacity and decrease in price, backup to disk with dedup is still a challenge. Small businesses know they want it to save money but cannot afford the minimum investment required to reap the benefits. It starts with shared storage. Building a storage pool that can be accessed by the backup servers in the environment enables the cost of disk storage for backup to be shared across multiple applications for both primary and secondary storage. Small businesses also need this shared storage in order to achieve high availability (HA) for virtual servers. Use deduplication to eliminate redundant data and make backup to disk as cost effective as tape alone. Only one unique instance of the data is actually retained on storage, and redundant data is replaced with a pointer to the unique data copy. With recent developments and innovations, there are new deduplication options integrated into backup software suites that lower the entry cost of deduplication. Using the media server that is already required for backup, deduplication can be performed for all clients centrally, with no added complexity. For client systems with the right resources (CPU and RAM), deduplication at the client can also reduce LAN traffic between clients and backup server. Combining media server deduplication with client deduplication on selected systems meets the challenge, resulting in a cost-effective solution that small businesses can afford. Investments in tape can continue to be leveraged for offsite and archiving. Comparing approaches to deduplication in which Drobo provides the simplest and most affordable solution for disk-backed backup. Client/source deduplication is available only for Windows Agents (Exchange, Agent for Windows, SQL Agent, and so on). Install Drobo Dashboard on management server (can be on backup server). Deploy SAN storage device, easy 1-click setup with Drobo, configure smart volumes. If not yet installed, install Backup Exec 2012 on media server. Install client deduplication software if you wish. Three easy steps to enable deduplication with Backup Exec 2012: install option, define dedup location, target backups. Run a backup with dedup and test the restore, you are now doing disk backup with dedup! 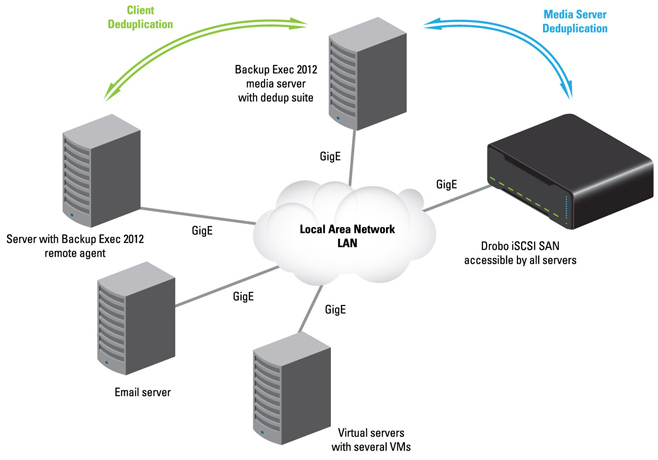 Bonus - look at adding resiliency and HA using Drobo for virtual server mobility. SAN storage is a must when you need to consolidate storage for disk backup, enable virtual machine mobility, or both. Everyone wants fast backup and recovery of data, but many cannot invest in enterprise-class solutions. SMBs don't have the budget for Fibre Channel SANs and deduplication appliances, and even the lowest-cost iSCSI storage and smallest entry-model appliances are expensive by most measures. Drobo provides superior data protection with BeyondRAID™ technology in a package that is very affordable. Without the cost burden of features built into the product, small customers have the freedom to combine best-of-breed technologies that are tailored to their needs. Combining Drobo for disk backup and deduplication as a software component in their backup media server provides a solution that is less than half the cost of an entry-level deduplication solution for enterprise customers. And the incredible ease-of-use is a huge plus!